My sister had our parents come to babysit her 2 children when she and her husband had to go out of town. Aside from the 432 rules, regulations and instructions she left regarding her kids, she had one rule about the dog. Piper had just gotten out of the hospital for cancer and he didn’t have much time left. So, for the last few weeks, every time I would visit her house she would ask “did you come to see Piper for the last time and say your goodbyes”? This has been going on for about a month now. Anyway, Piper is a little slow and not as agile and quick as he used to be due to the medicine and his operation. This is only important because his most favorite thing to do in the whole world is to twirl and prance around the front of the car, any and every car that leaves his driveway. The Rule: Put the dog in the house before you leave so you don’t run him over because his reaction time is a little slow. This seemed like a logical request. My sister was only gone 24 hours and so it was with some shock that when she returned the first thing she saw was that Piper’s front legs were all scraped up and he was missing most of the fur on these two legs. She ran into the house and said, “Piper got into a fight with an animal and he is all hurt on his legs”. Silence. “What happened to Piper?” Silence. “The Dentist? Why were you going to the Dentist” asked my sister. Instead, she is left with her two kids as the only witness to this crime, T who is 7 and little D who is 4. First, she asks T, “Did Pop Pop run over Piper?” She shakes her head and said “ He said he didn’t, that’s all I know.” And she walked away. Next witness. Little D’s time to turn state’s evidence “Did Pop Pop run over Piper?” my sister asked him in her sweetest most innocent voice. He looks at her and stares her down and says “I don’t know anything and I don’t want to talk about it, you have to ask Pop Pop”. Then he walks away. On My God, he got little D to act as an accessory after the fact. He is guilty. He did run over the dog. Finally he admits this is a possibility but continues to swear that he didn’t hear the rule about putting the dog in the house before leaving so even if he did hit him it wasn’t his fault because he didn’t know about the New Rule. “How was I to know he wouldn’t get out of the way this time” was the best she got out of him by way of any admission of guilt. 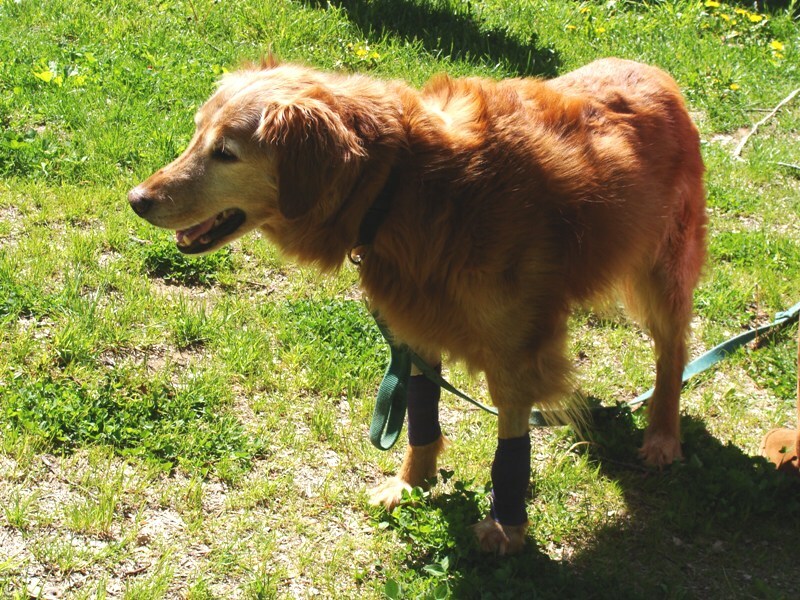 Piper is still alive and now sporting bandages all over his front legs compliments of the vet and possibly my Dad. Several days after the alleged incident my sister remembers that she has outside security cameras. DUH. You might have thought of that before you brought out the dripping water and bamboo shoot under the fingernail torture tricks to coerce a confession out of our aged parents. So she plays the tape. There is my dad and mom getting in the car. There is Piper twirling and prancing around the front of the moving car. There is my dad hitting Piper with the car. There is my dad and mom getting out of the car and assessing the damage to their front bumper. There is my mom and dad watching the dog limp off into the side yard – not yelping I might add, which would have been the sure sign they had hit him, according to my mom, not that the fur on the bumper and the limp was not indication enough. Then they get back into the car and drive off. OH MY GOSH. I am so ashamed of them. She had him on tape for crying out loud. No wiggling out of this one. When confronted with the video evidence we all clamored guilty as charged. He responded “I plead insanity, those kids were driving me crazy and I couldn’t think straight, 80 year old people should not be around little kids too long – it makes them lose their minds. But they were loyal and they didn’t throw me under the bus”. Yeah – well tell that to Piper – he was thrown under your car. Can you believe him? He really is crazy!